Finales can make or break a television show. Some finales are fabulous codas (most notably, in my mind, Buffy the Vampire Slayer and Life on Mars). Others leave something to be desire (i.e. Pushing Daisies and Veronica Mars). And still others are downright infuriating (Lost, V, and Battlestar Galactica to name a few). It’s really aggravating in particular when a television show’s finale taints everything that came before it. 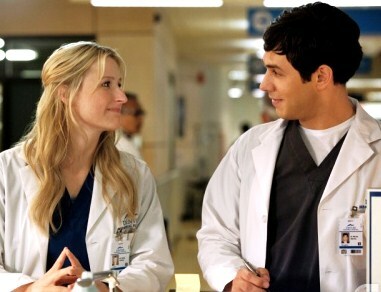 Last night, Emily Owens M.D. ended. Emily Owens was my favorite new show of the season. It might not have been brilliant, but it was certainly fun. I didn’t want to see it leave the air, but, after I learned it was ending, I had hoped that it would at least have a better ending than it did. For the record, I am neither Team Micah or Team Will. I liked both characters but didn’t think either of them were particularly well suited for Emily. Micah was too nice, and Will had too much growing up to do. She needed someone with a bit more edge and a bit more confidence than either of them. Still, if she had to end up with someone last night, I would have chosen Micah. Her sleeping with Will seemed entirely abrupt. I don’t think Emily would have wanted to be his rebound regardless of how much she liked him (she’s too conscientious and neurotic for that). Also, I don’t entirely buy that Will likes her. He was jealous, but that just makes him a jerk—not a viable love interest. I don’t buy that either of them would have thrown themselves at each other like that—not, at least, if they weren’t really, really drunk. It basically undercup the rest of the season. I was freaking out at the end because of poor Micah. I may not have been actively rooting for Emily and he to get together, but I didn’t want him to be dumped like that. It was cruel of her to do that. Just imagine how brokenhearted he would have been (AND how awkward it would have been at work after that). I understand that the showrunner wanted Emily to get Will out of her system, but it shouldn’t have been done like that, especially since there will be no follow through. I wish there had been a flash forward to round off the series. I would have liked to see her together with one of her love interests some where down the road. Life Unexpected flashed forward. I wish Emily Owens had done the same. Sadly, Emily Owens has become one of those shows that I will have no desire to watch again. Up until last night, that wasn’t the case. The finale, however, sealed the deal. The ending was bad vs. unsatisfactory. I could have handled a vague ending but that Emily/Will ending just ruined everything. I understand the showrunner didn’t have much of a choice, but still, I think something could have been tweaked or done better to leave the audience with a semi-fulfilling ending. i wished the writers changed episode 13. the ending left everyone with eyes and mouth wide open. how?! how could that neurotic, overly logical person be just a downright, un-awesome heroine that she was aiming to not be. what a let out? !